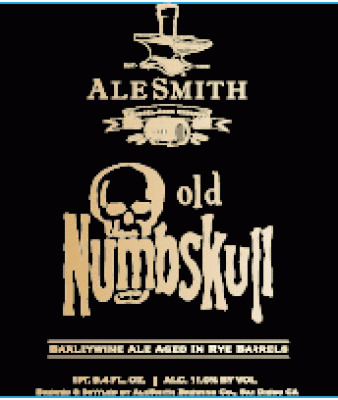 "AleSmith's next release, as part of our 2013 Reserve Series, will consist of Rye Barrel Aged Old Numbskull and Barrel Aged Grand Cru. A new twist on the barrel-aged version of our American Barleywine, Old Numbskull has been matured in premium rye whiskey barrels for over a year to develop its rich and intense flavor profile. The result is an amazingly complex beer that balances the caramel and toasted malt character of Old Numbskull with spicy notes of vanilla and oak from the barrel aging process. Also, if you didn't get your hands on one last time, now's your chance - Barrel Aged Grand Cru is back! Earlier this year we released this unique, first-ever wine barrel-aged AleSmith brew and it was a great success. Barrel Aged Grand Cru is our Belgian-Style Ale that has been matured in American and French oak red wine barrels for a year to add layers of complexity to its rich flavor profile of dark fruit and Belgian caramel malts. The oak and red wine flavors imparted by the barrel-aging process blend seamlessly with subtle hints of raisin, plum, and bittersweet chocolate from the beer! Starting September 30th at 11:00am, you will be able to purchase up to four (4) bottles of Rye Barrel Aged Old Numbskull and up to four (4) bottles of Barrel Aged Grand Cru. Please note, your name will be registered once you place your order (you will need to use your name for each bottle). Any duplicate sales to the same name will be voided! We want to make this as fair as possible and get as many bottles into our wonderful customer's hands! Please USE ONLY YOUR NAME TO PURCHASE THE BOTTLES. YOUR PURCHASE IS JUST FOR YOUR BOTTLES. YOU CANNOT PURCHASE BOTTLES UNDER SOMEONE ELSE'S NAME OR FOR SOMEONE ELSE. IF YOU BUY THEM, YOU MUST PICK THEM UP. Please DO NOT PURCHASE BOTTLES UNLESS YOU ARE SURE YOU CAN MAKE IT TO THE BREWERY BY December 8, 2013. Proxies will not be allowed for this release, you will need to show your proof of purchase (in the form of CONFIRMATION EMAIL FROM BROWN PAPER TICKETS) and valid id to retrieve your bottles. NO EXCEPTIONS WILL BE MADE. This means you will NOT be able to pick up anyone else's bottles, and we will not release the bottles to you without a confirmation and valid id matching the name on the sale! IF YOU PURCHASE THE BOTTLE, YOU HAVE TO PICK IT UP! Please ensure you only pick up bottles during the following dates/times: Mon-Fri: 12-9pm, Sat: 11am-8pm & Sun: 11am-6pm. Please do not purchase bottles until you've read the terms and conditions listed on the sale page and can ensure you will be able to pick up your bottles by SUNDAY, DECEMBER 8th, 2013! To purchase tickets, please visit our Brown Paper Tickets sale page located here. The page will not go live until twelve (12) hours prior to the start of bottle sales (September 29th at 11:00pm)! For more information about our release party celebration on Saturday, October 5th see below." 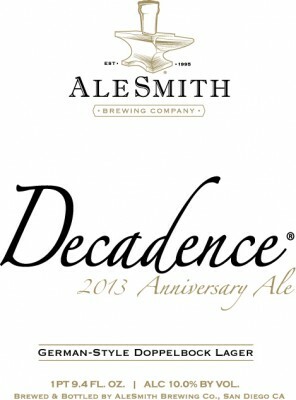 Decadence 2013 is a classic German-Style Doppelbock that follows the ancient brewing tradition of Bavarian Monks. Originally called "liquid bread", this style is characterized by a rich malt backbone that showcases notes of bread crusts and subtle hints of chocolate. A German lager yeast balances these flavors with a clean, full-bodied finish. (The actual bottle has the correct wording of "2013 Anniversary Lager", as this style is not an ale). 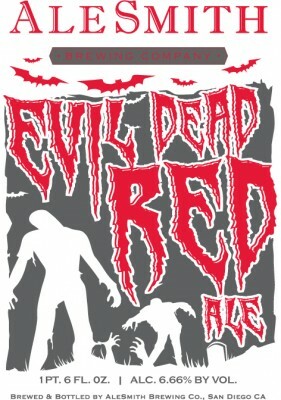 Evil Dead Red is our homage to one of our favorite holidays, Halloween! Deep blood-red in color, an intense aroma of pine and citrus from an abundance of american hops balances the sweetness and rich, bready flavors of this beer's caramel malts."